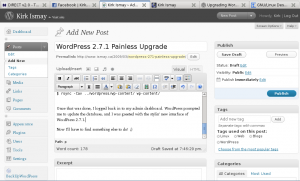 I had the evening free tonight, and decided to burn some time upgrading my blog to the latest version of WordPress. I checked out the handy upgrade instructions, and then went to work. In less than 10 minutes, I was all done. I host my blog on a Debian Linux server at work, and did the upgrade via ssh. To get started, I used the BackUp WordPress plugin to backup my files for safety’s sake, then I disabled all plugins as instructed. I should mention that all of my plugins were up to date before the upgrade, which is probably a good idea to prevent compatibility issues before they start. With that done, I logged back in to my admin dashboard. 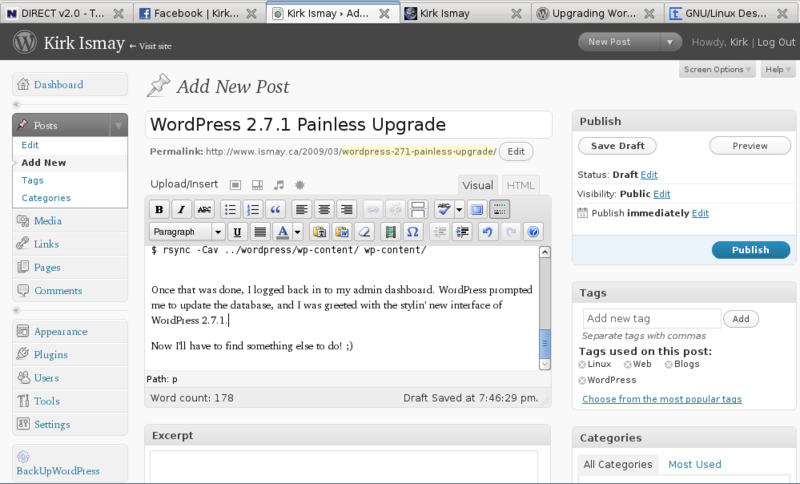 WordPress prompted me to update the database, and I was greeted with the stylin’ new interface of WordPress 2.7.1.